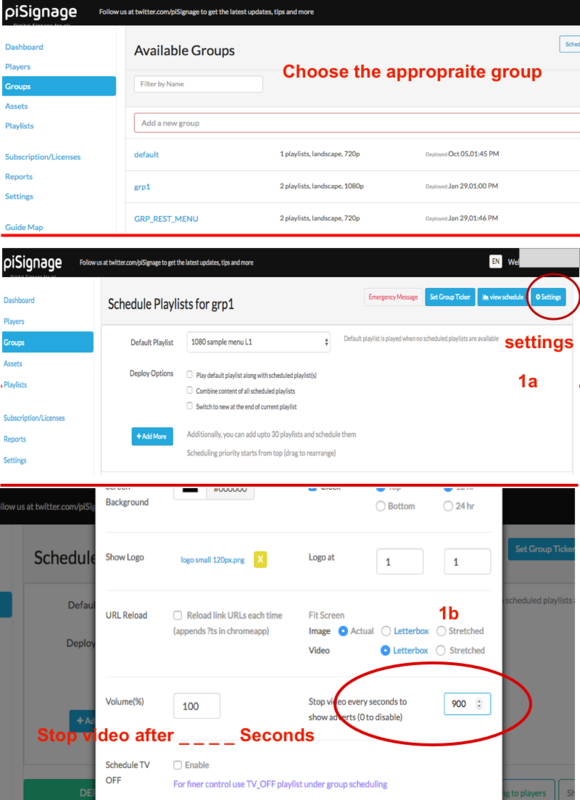 We have introduced a feature on demand in piSignage where you can pause a video in between, display Ad and then again resume the video from the same point. This Feature is of great use when you have large duration videos as assets. We have seen how to Insert Ads between regular playlist . Here when it is time for the Regular playlist to be paused & ADVT playlist to start, the Asset of Regular playlist, currently playing on screen will always complete its display time. It will not be interrupted in between. Thus even though it is time for ADVT playlist to be displayed, it will be deployed only after current asset being displayed completes its time. Say your asset is a 30 minute video or you have an image asset in your playlist for which you have set a display time of 30 minutes, with the regular ad insert feature , it is impossible to display Ad in between this time period. Only after asset completes its 30 minutes display, The Advt playlist will be deployed. . There is an option in Group Settings to specify the time at which a video asset has to be stopped to show videos. First Go to the relevant group running playlists with video assets that has to be paused. Go to the Settings section (1a) at top right, A popup window opens. Scroll down to the Stop video (1b) section and specify the time interval at which Video has to be paused . (refer Screenshots). Let us say your regular playlist has Number of Long Video assets, ie each of duration more than 15 minutes . Now if you have given the entry "Stop video after" as 900 as in the example shown, After every 15 minutes video asset being displayed is stopped and piSignage will check if there are any ADVT playlists to be deployed. If there is a ADVT playlist Scheduled or waiting to be deployed, it will run. After its completion , the video asset of the Regular playlist will resume its run from tha paused point. If there is no ADVT playlist scheduled , then the regular playlist will immediately resume and and the check for ADVT playlist will be done at next interval. In the given example it will be every 15 minutes. The feature is more effective in pausing long videos at comparatively larger time intervals. ie the pause and display feature may not effectively say if you are stopping the video say every 60 seconds. As said this feature can ONLY be used to pause and resume VIDEO assets. If you have an Image asset or any other kind of asset , it will always complete its display as per time alloted in the playlist. For example if you have given an image asset to be displayed for 20 minutes in the playlist, any Ads triggered during that time frame will only be deployed after the asset completes its 20 minutes. With other type of assets we cannot pause and resume display . 1) if you have multiple 20 minute video assets, a pause time of 30 minutes is useless. The time count for video pause starts as one video asset starts playing and terminates when the video ends. For the Next video asset Count starts afresh. Here Ad inserts will act as in Regular circumstance. 2) If you have a 90 minute video and pause time of 20 minutes , this video will pause 4 times during its run to look for Advt playlist. if any Advt playlist is scheduled during that time it will be deployed, else the video resumes.